FARMINGTON HILLS, Mich. – (May 29, 2018) – CCE, a leading engineering software and services provider, announced a major update to its EnSuite-Lite software that views and translates 3D CAD data. "We are very pleased with the response to EnSuite-Lite as a robust low-cost viewer and translator solution for an enterprise dealing with multi-CAD data," said Vinay Wagle, CCE's Vice President of Sales and Marketing. "This new version helps users keep pace with new CAD releases by providing support for all the latest version updates. 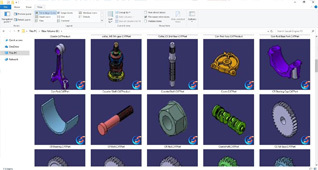 We also enhanced it so that users can view CAD thumbnails right inside File Explorer. 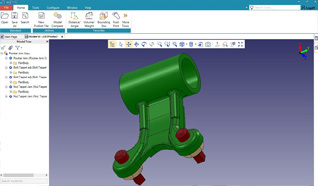 This significantly improves productivity by allowing the user to locate the right part or assembly file without even getting into the CAD GUI “added Wagle. Ability to view and translate models created using SOLIDWORKS 2018, CATIA V5 R27, NX 12, Autodesk Inventor 2018, Solid Edge ST10, JT 10.2, and Parasolid 30. Option to export all supported formats to STEP (242 version) files. Tools to change appearances, show/hide, and move component. Ability to view 3D CAD thumbnails right inside File Explorer. For additional information, please visit the EnSuite-Lite page. EnSuite-Lite has viewers for all commonly used CAD formats. You do not need CAD software or licenses to view any of the supported file types. Viewers are currently available for CATIA V4, CATIA V5, CATIA V6 (3dxml), SolidWorks, NX, Pro/E (Creo), Solid Edge, Inventor, Rhino, JT, Parasolid, ACIS, IGES, STEP, VDA, CGR, DWF, & STL. Incorporated in Michigan, CCE has more than 25 years of CAD/CAM/CAE software development experience, as well as an extensive background in related services. Since 1989, CCE's focus in CAD technology & application development has spearheaded its mission to deliver customers value through innovative, disciplined, and communications-focused technology products and services. CCE has offices located in Farmington Hills, Michigan and Fort Lee, New Jersey. For more information on CCE's products and services, visit www.cadcam-e.com.